cancellation policy of 72 hours prior the arrival if not the whole price of the reservation will be charged. Mexiqui Zocalo is a renewed space dedicated to society and travelers with the main objective of becoming a community through hospitality, gastronomy and cultural integration Few spaces within this giant city have such a fortunate location. Located in front of the center of the universe according to the Mexicas, better known as Templo Mayor and the privileged panoramic view of the Great Metropolitan Cathedral of Mexico City. Mexiqui Zocalo offers you 9 fresh, modern and cozy rooms inside a newly remodelled building from 1950 transformed with a series of avant-garde touches. Our aim is to be able to offer a comfortable space through a quality service within a liberal environment. We want to make your stay an unforgettable experience, that your visit will become an unexpected adventure that takes advantage of all the wealth, traditions and customs that Mexican culture can offer. Mexiqui Zocalo is located in a pedestrian street of Republic of Guatemala 30, behind the famous Metropolitan Cathedral of the Historic Center of Mexico City. And just a few meters from the Central Zocalo, the Templo Mayor, the National Palace and the Plaza de la Constitución ... history and culture just a few steps from our entrance! The building retains its original style, although it has been recently renovated in order to offer ideal spaces to enjoy, share, relax and meet people from all over the world. 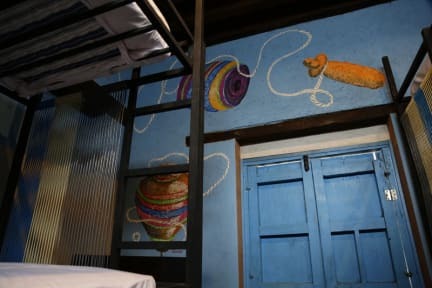 You will be able to appreciate different interventions and amazing murals all over the walls inside our individual bunk bed dorms while you chill on your bed, organize your belongings in our security boxes or just take the time to get to know the people around. You can sunbathe, breathe fresh air and refresh yourself with a drink on our terrace along with the view of Mexican historical monuments, but in case you have had a heavy day you can rest in the communal room enjoying a movie, listen to musician, meet Travelers or even cook a good meal. Localização privilegiada, equipe super atenciosa, chuveiro quente, elevador e instalações caprichadas . Pertinho do metrô e Metrobus . Super recomendo !! Ótimo Hostel, um pouco novo por isso ainda vem se consolidando! Mas localização e infra estrutura bem massa! Certeza que em pouco tempo será um dos principais de Zocalo e da Cidade do México. Mexiqui is an amazing Hostel. It's pretty well located, the bedrooms are great and really comfortable beds. The bathrooms are usually pretty clean (you guys just need to pay attention to refill toilet paper during the day). 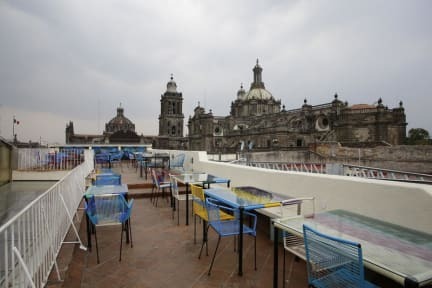 One of the best things at the hostel is the rooftop, you can always go for some beers upstairs and you get a pretty great view from the Zócalo. I definitely recomend Mexiqui Hostel! A localização não poderia ser melhor. No coração da cidade, perto dos museus, do metro, e dos restaurantes. A equipe é muito atenciosa... especialmente Ismael que se preocupava em dar as orientações. Infelizmente, não havia água quente no banheiro.